Gorgeous remodeled 2-story 2-bedroom/2 bath oceanview unit at Maui Kamaole, a AAA 3-Diamond property rated 4.5 stars by Tripadvisor reviewers. 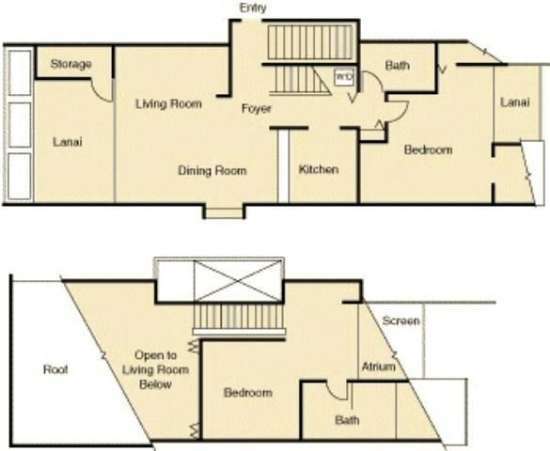 This spacious luxury unit has had a complete remodel with travertine floors in the kitchen, entry and both bathrooms, new kitchen with cherry cabinets, granite counters, and stainless steel appliances, and new bathrooms with granite counters. Air-conditioned with 3 separate lanais (patios), one off the living room, and one off of each bedroom. The upstairs loft master suite has a private bathroom with travertine floors, granite double sink, and beautiful walk in shower with window looking out to the private lanai. It is furnished with a king Tommy Bahama canopy bed and large flatscreen TV. 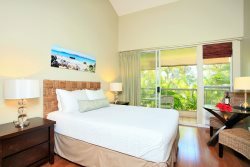 The second bedroom is modern and luxurious with a queen canopy bed, private lanai, and large flatscreen TV. Beautiful oceanviews, free US/Canada long distance, 52" HDTV in living room with Nintendo Wii, free high speed wireless internet, and free US/Canada long distance calls. Maui Kamaole has 2 pool/recreation areas, including the tropical upper pool with waterfall, and is just across the beach from a great sandy swimming beach, Kamaole 3 Beach Park. This unit includes lots of extras like boogie boards, lightweight beach chairs with backpack straps, large beach towels, tennis rackets, cooler, and baby gear such as baby gate, PacknPlay portacrib/playpens and booster/high chairs.